Who’s ready for the Common Core? Many schools and districts are re-assessing what they need to do, and how much they will need to spend, to comply with the new standards. A recent report put out by the Pioneer Institute estimates that "cost of transition" to the Common Core for school districts will be approximately $16 billion over seven years. One of the biggest expenses appears to be the technology required for Common Core-aligned testing. Both of the approved assessments, the Smarter Balanced Assessment Consortium (SBAC) and the Partnership for Assessment of Readiness of College and Careers (PARCC), are computer-adaptive and need to be taken on digital devices. 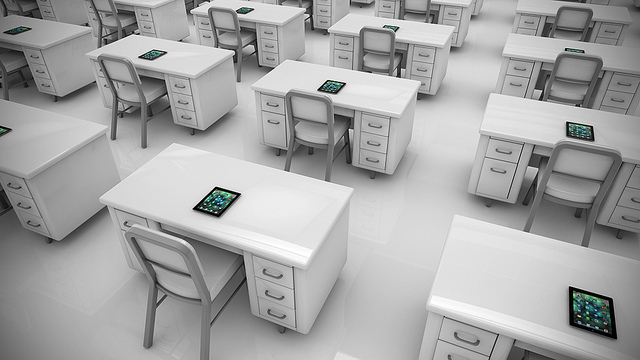 "Many districts have deployed literally thousands of devices and have not adequately considered sustainability, support or refresh of these devices." Tucker currently has no in-class technology for students to use besides her own district-provided, repurposed Mac, so her students bring their own devices, and Tucker, who's a Google-certified teacher, employs her Google training to make the students’ iTouches, iPhones and various tablets and readers seamless learning tools for class. But if the district is going to buy laptops or tablets for classrooms, she wants to be consulted, because Tucker believes there are distinct advantages of some over others. For example, she wonders if district leaders are aware that the Nexus tablet is more compatible (not to mention more affordable) than the iPad with Google Drive and Google Apps, which many teachers already use. Ideally, Tucker said, technology for learning can only be transformative if teachers are willing to embrace it -- and that requires teacher input on what to buy, and high-quality professional development to support teachers in how to use devices. She hopes that administrators will listen to teachers’ needs, like her district is doing with the "try before you buy," initiative and not just focus on assessments. “I think it will be interesting to see what teacher feedback is, compared to what is purchased,” she said. When buying digital hardware for a school system, says Andrew Marcinek, technical director for the Groton-Dunstable, Massachusetts, public schools, it’s imperative to consider more than just testing. Shortly after taking the job as lead technologist for the district, Marcinek received a $562,000 windfall from the town council to spend on updating technology for the whole district (Superintendent Anthony Bent said he was unaware of any money coming from the state for Common Core technology upgrades). After spending some of the money making sure that every school building was equipped with wifi, Marcinek purchased 600 Samsung Chromebooks as well as 100 iPads for elementary use. When buying technology for an entire district, he said, cost is important, but so is sustainability, and attention to detail. For example, he learned the PARCC assessment can be taken on an iPad, but not without a keyboard attachment, for a total cost of $400, making it double the price of the Chromebook. “So we get two Chromebooks for every iPad,” he said, “Plus, Google management is so much easier for tech administrators to use when you don’t have an influx of cash for one-to-one.” Many of his teachers already used Google Apps and Google Drive, and the single sign-on aspect of using an iPad can make sharing frustrating. But bringing technology into classrooms is inevitable, and schools will need to catch up. Perhaps getting ready for the Common Core assessments is a way to force schools into the future. "The reality is that technology has been a part of the curriculum for several years. Schools are already highly invested, and many actually do not have to make large purchases [for Common Core] because they already have the technology," said Andrea Bennett, the Executive Director at California Educational Technology Professionals Association. "I will also add that we need to stop thinking of technology as something new and special when it comes to education. It is an essential part of the learning environment along with electricity and heat and textbooks," she said. "Technology won’t improve learning outcomes. Good teaching will." Correction: An earlier version of this post included the wrong total price of the iPad and keyboard. The current version reflects the correct price.